“I am not scared,” says Meha Qewas, sitting at her small dining table with her 1-year-old daughter on her lap. In front of us is a plate of knefa, a very rich, sweet cheese dish covered in syrup, together with huge tumblers of juice many times bigger than what I’m used to being offered. Meha clearly values hospitality. The only thing sweeter than the mid-morning “snack” is the ebullience and warmth that flows out of Meha and her husband Hesen Mostefa. When she says she is fearless, Meha is talking about finding work in Vancouver. Despite the challenges, she is confident both in her new friends in the Vancouver Jewish community and in her own ability to master English and overcome whatever other obstacles she may meet. Her confidence is not groundless: Meha was the main force behind and organizer of getting her husband and three children first out of Syria, then out of Iraq, the country where they took refuge for five years. “I wanted my children out of there,” she says, recalling the sight of Syrian children and youth in Iraq taking up smoking and selling candy on the street to make income for their families in the packed, rat-infested refugee housing. Hesen also has a remarkable story to tell. Trained as a surgeon in Syria, he volunteered in Iraq with Médecins Sans Frontières (Doctors Without Borders), which eventually hired him as a doctor. During the years they spent in Iraq, Hesen put in long days with MSF while Meha struggled to take care of the children, run a household and plan their flight from Iraq. Eventually, Meha succeeded in securing passage to Canada with the help of sponsors from Vancouver’s Temple Sholom. Temple Sholom’s efforts to sponsor Syrian refugees started with a High Holidays sermon from Rabbi Dan Moskovitz about the refugees’ plight. Members of the shul immediately formed a committee of volunteers to bring in at least one family, and others, if possible. Meetings with the Jewish Federation of Greater Vancouver and the Anglican Diocese followed (the diocese is a federally approved sponsor for refugees with which other groups can team). The committee learned about private sponsorship and began working through Mosaic, a local agency that serves newcomers and refugees, and were connected to the Mostefas. The process to bring them to Canada was started. In December 2015, however, Canada pulled some immigration services out of Iraq and began working through Jordan. A letter that Moskovitz gave to Senator Mobina Jaffer about the Mostefa family and their situation apparently found its way to the prime minister, and services in Iraq were reinstated as a result. The synagogue’s efforts did not end there. They have since brought in another family, Bawer Issa, Shinhat Ahmed and their newborn son. The Issa family was welcomed at a Shabbat service in the synagogue on Aug. 25 (it can be seen on YouTube). Bawer spoke movingly at that event, recounting how some people had asked him if he was surprised, as a Muslim, that he had been rescued by Jews. “We were not surprised,” he told the congregation. “Growing up in Iraq, we were brainwashed at school every day to hate Israelis and Jews as our number one enemy. My Kurdish father always told us not to care what they said, not to believe it. He told us that Israel had been the first to send aid when Saddam Hussein bombed us with chemical weapons.” Citing Israel’s continued support for Kurdish self-rule, Bawer said that he had already known that Jews were their friends. 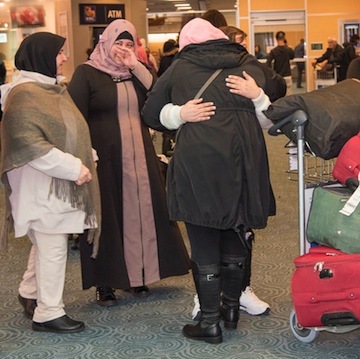 At the upcoming biennial meeting in Boston of the Central Conference of American Rabbis, the umbrella organization of the Reform movement, a resolution – that Moskovitz helped write – will call for the sponsorship of 36 more refugee families by Canadian congregations. The wider Vancouver community is invited to welcome the Issa and Mostefa families on Sept. 10, at 11:30 a.m., at a reception at Temple Sholom that also marks the first day back of the synagogue’s Hebrew school. An RSVP is requested to 604-266-7190 or via templesholom.ca/get-know-new-canadians. 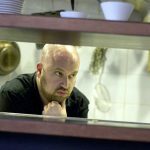 A Tel Aviv restaurateur and bar owner wanted to do something about the dire situation of Syrian refugees, so he turned to what he knows best – food. Yair Yosefi is the owner of Nahalat Binyamin restaurant Brut and bar Extra Brut. Thinking about how he might be able to help, Yosefi connected with his friend Ronit Vered, who is a food journalist. Together, the two created Kitchen Without Borders, which raises awareness of the plight of and funds for Syrian refugees. They have raised funds by selling Syrian-inspired dishes at their restaurants and by getting other restaurants to join in the fundraising efforts. Yosefi started Brut and Extra Brut with partners two-and-a-half years ago, soon after he returned to Israel from Paris, where he had been living and working for 10 years. He is now married and has a four-year-old daughter. Being the father of a young child, Yosefi feels especially concerned with the situation women and children are facing in Syria. With his friends in the restaurant industry, he wanted to help, but the question was how. “Every restaurant decided on a dish – either one inspired by Syrian cuisine or, if that wasn’t possible, like with Thai or French restaurants, they’d choose a signature dish,” said Yosefi. “All the revenue from this, which ran for a few weeks, went to a foundation called Karam, based in the U.S. and created by ex-Syrians. Karam uses donations to help, especially, kids … education…. It’s very important. Restaurants throughout Israel joined in the effort to raise the funds, many in Tel Aviv, as well as some Arab and Palestinian restaurants, from large restaurant chains to small mom-and-pop operations, said Yosefi. About how much was raised through the project, which ran Jan. 15-31, Yosefi explained that he and the other organizers decided ahead of time that every restaurant would donate directly to the foundation. “We trust each other, so we’re not even asking,” he said. “We decided not to count the money. Everybody gave what they made. I know it was quite an important amount … but, most important, it was an issue that was spoken about in Israel and the money obviously helped them – the refugees. Brut chose this particular recipe because the ingredients are locally sourced, something they put an emphasis on with all their food. In September, Yosefi and his team will be going on the road for a few events in the United States, with stops in Charleston, Nashville and New York. They have been invited to Tokyo this April to do a pop-up booth. In a rare venture into current events, the head of Yad Vashem has spoken out about the urgency of humanitarian disaster in Syria. After the forces backing Syrian dictator Bashir al-Assad succeeded in taking the rebel-controlled areas of Aleppo last week, murderous retribution unfolded and terrified residents fled for their lives. It is not insignificant that the head of the world’s leading Holocaust museum and memorial would be moved to speak out on the subject. The atrocities the world is seeing stir memories of the past. No history is precisely like other history, obviously, and making direct comparisons can be unhelpful. Yet, after the Second World War, as the extent of the Holocaust became understood, international agencies, nations and individuals committed to a future free of those sorts of atrocities. Those promises have been betrayed too many times in the seven decades since, most recently in Syria. When we look back in history, we ask, why didn’t this party or that country do more? Why was this or that allowed to happen? How did the world not step in sooner, when evidence began to mount about the rising danger of authoritarianism? Questions and answers are easier in hindsight. Yet there can be no doubt that Syria has presented especially difficult choices, even for actors who want to do the right thing. U.S. President Barack Obama has insisted through the years of the Syrian civil war, which began at the time of the Arab Spring in 2011, that there was no military solution to the problem; that diplomacy had to prevail. He may have been correct that there was no military resolution. There are multiple bad guys in this fight – Assad’s regime, backed by Iran, Hezbollah and Russia, on one side, and al-Qaeda and ISIS on the other. And, on the third side – because this is, vexingly, a multiple-sided conflict – is an amalgam of defectors from the Syrian military, Kurdish militias, and other anti-Assad forces who may have democratic and pluralist intents. Or, were they to be victorious – which now seems unlikely in the extreme – they could split among themselves, their only cohesion perhaps being the glue of opposition to Assad. By one count, what we call the Syrian civil war is as many as 10 separate conflicts. The United States, Saudi Arabia, Turkey and Qatar have provided some support to the rebels, but it has been unreliable and uncoordinated. Estimates of the number of civilians and fighters killed range from 312,000 to more than 400,000. Civilians casualties have been enormous, with all sides indiscriminately attacking civilian targets. Torture and extrajudicial killings typify the regime’s approach to war. Assad’s forces have also been accused of deliberately targeting medical installations and personnel. When the United Nations was able to secure humanitarian aid routes within Syria to provide food and medicine, the regime ensured that aid reached government-controlled areas and prevented aid from reaching rebel-controlled areas. Negotiations have gone nowhere, because Assad is determined to hold on to power no matter how much of his population dies in the process, and he has powerful military friends in Russia and Iran who back his iron fist. The opposition is unequivocal that Assad must be deposed. There is no room for negotiation. And so, the matter has come down to military might, with the last stronghold of the opposition crushed in recent days. Assad has now regained control of almost all the population centres of the country, with the rebels limited to peripheral enclaves. In the process of the civil war, half of Syria’s population has been uprooted – six million people are displaced internally and another six million have been made refugees, with global implications, as European, American and other politicians have exploited fears of radicalization among refugees to advance their own xenophobic agendas. The effect may ultimately unravel the entire European Union. Meanwhile, Hezbollah has been significantly strengthened and ISIS, which has suffered in Syria, will likely turn its attentions to more fertile ground elsewhere. The murderous Assad regime is more secure than it has been in years. Russia is ascendant in the region and globally. The United States has been chastened, and the incoming president is, characteristically, belligerent in rhetoric but anti-interventionist in expressed policy, which indicates nothing if not pandemonium in future U.S. approaches. The world has failed the people of Syria – and, as a result, the world is a far more dangerous place. Significant blame for this disaster must be placed on the United Nations, the primary bodies of which are hobbled by the control of despots who owe more to Assad’s governance style than to the vision of the idealists who founded the organization. While there are agencies under the UN umbrella that do superb work, its governance structures are so dysfunctional that talk of a replacement body must continue in earnest. The least the world should be able to do now is pressure the emboldened government of Assad to allow humanitarian aid to reach those who need it and allow his citizens to move to places of safety. Then, the world should reflect on the lessons of this catastrophic experience and promise, yet again, not to let such a thing recur. What we’re doing isn’t working. To prevent recurrence, we need to stop pursuing the definition of insanity, which involves doing the same things and expecting a different result. There’s a new dance routine on social-media sites that has five catchy poses and one enormously powerful message. The #iamchild dance-therapy routine is part of a project in support of Syrian children affected by ongoing civil war. It was created by Israeli-Turkish journalist Michal Bardavid to give emotional and moral support to millions of the world’s refugee children. In addition to being an international correspondent for China Central Television, Bardavid is a psychological counselor and a certified dance therapist. After meeting hundreds of Syrian children in refugee camps on the Turkish-Syrian border, she created a motivational dance exercise made up of five positively worded sentences accompanied by five movements to show the kids that someone cares. The five phrases – “I am loved,” “I am a child,” “I am safe,” “I am a whole person,” “I am beautiful” – are spoken in Arabic. “The accompanying movements make the emotion more concrete as children say the sentences out loud,” Bardavid writes about the project. In honor of United Nations Universal Children’s Day on Nov. 20, a day that promotes “international togetherness, awareness among children worldwide, and improving children’s welfare,” Bardavid uploaded a call-to-action video – in English and Turkish – asking people to join the movement and show support for the Syrian kids. So far, she has documented 600 Syrian refugee children and 350 Turkish schoolchildren doing the #iamchild dance routine. Children in Israel, Iraq, Spain, the United Kingdom and Turkey have sent in heartwarming homemade videos of how they perform the dance routine. “#iamchild is about empowering Syrian refugee children, creating solidarity among Syrian and international children, and increasing global awareness on the issue,” writes Bardavid. The current refugee crisis – and Canada’s responses to past crises – was the topic of an interfaith panel recently, which raised issues especially relevant as Passover approaches. Our Home and Native Land? A Multi-Faith Symposium on Refugee Settlement featured a keynote presentation by Dr. Harold Troper, co-author of None is Too Many: Canada and the Jews of Europe, 1933-1948. 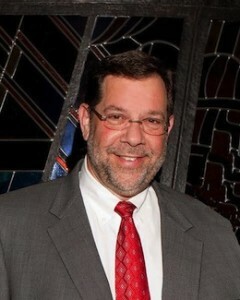 The event, on March 18, also included a panel discussion that featured Rabbi Dan Moskovitz of Temple Sholom. Catalina Parra brought a First Nations perspective, Imam Balal Khokhar spoke from a Muslim point of view and Rev. Dr. Richard Topping spoke as a Christian. Troper expounded on the concept of “new Canadians,” a formulation perhaps unknown in any other country, in which people arriving with the intent of making Canada their home are acknowledged not as foreigners or as migrants, but as people becoming part of our polyglot population already on a path to inclusion. Of course, Troper acknowledged, this was not always so. None is Too Many, published in 1983, was a seminal book that has had lasting impacts on Canadian views of migration and refugees. The title comes from a quote from an anonymous Canadian immigration official who responded with these words to the question of how many post-Holocaust refugees to admit. The words have been attributed, in some tellings, to F.C. Blair, Canada’s then-director of immigration. However, while this is not provable, Blair’s actions were in line with the words. Recounting this country’s exclusionary policies toward the desperate Jewish populations of Europe in the prewar period, but also a similar disregard after the war, the book has been held up as an object lesson in how not to respond to people in crisis. Troper said he didn’t know until years later the impact the book had had on one very significant episode in Canadian history. In 1979, Troper and Abella sent an academic paper that preceded the book to Ron Atkey, Canada’s immigration minister. Atkey was a member of Joe Clark’s cabinet and, though that Progressive Conservative government lasted only nine months, it was during Clark’s term as prime minister that the decision was made to welcome 60,000 Vietnamese refugees, known as “boat people.” Troper said he found out later that the manuscript they sent played a role in the decision. “We hope Canada will not be found wanting in this refugee crisis the way it was in the previous one,” the authors wrote in a note accompanying the manuscript. They expected no response and they received none. But, several years later, Troper said, Atkey told him that he had read it. Already predisposed to encourage his cabinet colleagues to take a generous approach, the article stiffened his resolve to stand firm against ministers who disagreed. The government initiated a joint federal-private sponsorship program. “It today serves as the prototype for Canada’s Syrian refugee program,” said Troper. Now, as refugees are coming from North Africa, Asia and, most notably, the Middle East, fleeing civil war and ruin in Syria and Iraq, Troper sees parallels between the fears expressed now and those of seven decades ago. “The fears are not only around the expenses of accommodating these refugees, but that the intake of a population of different race, religion and cultural assumptions and social expectations will destabilize destination countries,” he said. Not dissimilar, he said, were fears that European Jews might bring socialism, communism, anarchism – even Nazism – with them. Another haunting parallel was the galvanizing photo of the 3-year-old Kurdish child who washed up on a Turkish beach and a photo Troper came across decades ago in his research for None is Too Many while going through archival boxes in the Toronto office of the Jewish Immigrant Aid Society. The boxes were filled with prewar letters from European Jewish parents who, knowing that entire families were unlikely to be granted admission to Canada, begged that their children might be taken in by a Canadian family. In each case, a terse response told the desperate parents that Canada was not admitting any Jews but that the request would be held on file in case something changed. As part of the panel that followed, Moskovitz spoke of the bread of affliction. “How inappropriate it might seem to hold up a matzah when we sit around a seder table filled with food, and to think that we are supposed to connect with this when we have so much,” the rabbi told the Independent after the event. “The point is to remind us that there was a time in our lives when we didn’t have so much. Religious perspectives are critical in this discussion, he added. For Jews, he said, the plight of refugees is not a momentary news story. The multi-faith symposium was organized by the Inter-Religious Studies program at Vancouver School of Theology and facilitated by Rabbi Laura Duhan Kaplan, the program’s director. Around the time of the High Holidays last year, Rabbi Shaul Osadchey, senior rabbi of Congregation Beth Tzedec in Calgary, had lunch with a congregant. Discussing various issues, they talked about the possibility of sponsoring a Syrian family. “We decided to pursue that and have the congregation get on board and assume responsibility for a family,” Osadchey told the Independent. With all enthusiastic and supportive of the idea, Osadchey gathered more information through Catholic Immigration Services (CIS). Later, he attended a workshop on how to sponsor a Syrian refugee family. Through CIS, the rabbi was introduced to an executive of Armenian decent who had married a Jewish man and converted to Judaism. As the woman worked with Osadchey, she took a special interest in the congregation’s sponsorship and wanted to connect them to a particular family – a Christian Armenian family with relatives in Calgary who she personally knows. “She had a personal connection and we thought that would be a good match, so we proceeded along those lines,” said Osadchey. “We were just simply committed to helping a Syrian refugee family and their religious background was of no particular relevance. 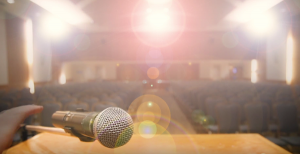 We were prepared for Muslim or Christian, either one.” He explained that his congregation has been very active in building bridges in the local Muslim community. After attending the workshop, the rabbi went back to the board with information about how the process works and the board unanimously passed the motion to adopt the family. Since then, they have been arranging all the paperwork, while the family to be sponsored is currently in Lebanon. Osadchey has also reached out to Jewish Family Service Calgary to see if they can help with jobs; the parents are in the jewelry trade. While the paperwork is being done, the community and congregation are offering support in many ways, from preparing to help with language needs, to collecting household furniture and other items the family may need. While the local Armenian Christian community in Calgary is not very large (300 to 400 people), Osadchey thinks it is inevitable that the communities will form closer ties. 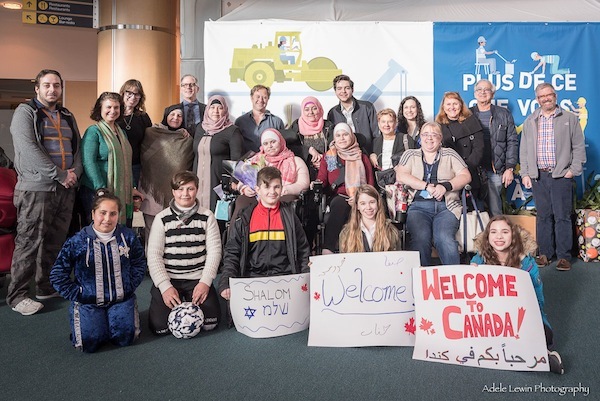 Last month, leaders of Beth Tzedec had brunch with the refugee family’s Calgary relatives to learn more about them before they arrive in two or three months. It may take less time than that, depending on various factors. But others in the congregation have also volunteered. For example, members of the congregation held a Chanukah party where, instead of giving gifts, they asked attendees to donate toward the sponsorship efforts. They raised $1,000. The financial need for hosting a family of five is estimated by the federal government at $32,000, but Osadchey has been working with congregants, one of whom may be able to offer housing, which will substantially lessen this estimate. “The $32,000 has already been raised, but we anticipate there will be other costs once they get here,” said Osadchey. While the congregation is considering hosting more families in the future, they have decided to take it one family at a time, as this is a very new process for them. The response from the congregation has been overwhelmingly positive, and a number of prominent people have stepped forward and expressed their pride in the synagogue doing this. And the response has spilled over to Temple B’nai Tikva, which has spoken to Osadchey.